Powered by Mom decided to throw a surprise giveaway just for some Easter fun. So we’ve brought back a favorite the dragonfly necklace! This time there will be not one but TWO winners! Since Powered by Mom is sponsoring this we’re making it open to US & Canada woohoo! 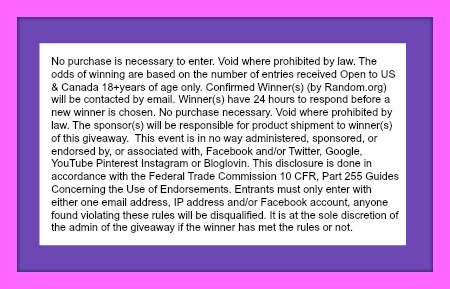 So enter now and GOOD LUCK! Just remember to follow the rules we wouldn’t want you to miss out cause you broke them! Enter below. We went to my parents foe Easter and had lunch and an Easter egg hunt for the kids. We had our meal here at home, just hubby and I today. It was nice and quiet but we did see the family later on. WE ARE HAVING DINNER AT HOME. just hanging out at home, watching my niece & nephews plunder their Easter baskets. We had our egg hunt & family dinner yesterday as today was supposed to be rainy (no rain yet, but it’s very black & gloomy outdoors) so today we’re just staying in & relaxing. We are going out to dinner since neither of the kids can be here. For easter at my home we are having all our family come over for a big Feast and then a huge easter egg hunt for the kids. We are having a small get together with family. Part of the family is coming in from the south. We are having a big Easter celebration dinner here. Hiding eggs all over the house for my daughter to find and that about it. having easter dinner And egg hunt for the grandkids. I’m having dinner with family! We are having family dinner on Saturday. I will probably do some yard work on Sunday. I am making dinner for my in-laws. I wish I was having Easter dinner in Virginia with my family. We have a lot of traditions we follow on each holiday and miss my family and the fun we have together. We honestly don’t do anything for easter and I wish we did but my family has several or no religion so to come together on a Christian Holiday doesn’t really work. We just have a quiet day at home. My whole family is getting together for dinner.. But on sat we will be taking out a friend that will be alone for lunch . I am visiting my son for easter. potluck and friends. love it. Having Easter dinner at my grandparents with the family. I have to work until noon, possibly later. If I get out by noon I will be able to make lunch with my dad’s side of the family. We are having a treasure hunt for the grandkids. Hubby is working all weekend, so we’re having a ham dinner on Monday with the family. Dinner for family at my house. I am working all weekend and so is hubby.